Standing Room Only is a boutique mobile caterer specialising in cocktail style wedding catering in Brisbane. We have over 30 years experience in the catering and hospitality industry. Standing Room Only holds a 5 Star rating for the Eat Safe Brisbane scheme operated by Brisbane City Council. Our commitment to quality food and professional service will ensure your wedding catering complements the memories created on your special day. Standing Room Only has proven to be the caterer to invite to your wedding or engagement party in Brisbane, as evidenced by the real client feedback below. Contact our Chef on [sro_clickable_mobile] to find out how we can help make your ‘stand up’ wedding a ‘stand out’. View our complete Wedding Catering Menu. The growing trend towards cocktail-style wedding receptions are an ideal way for the bridal party to mingle with guests. A common regret voiced by the bridal party is they felt they didn’t really celebrate with their wedding guests because of the ‘sit down’ format. Nobody wants regrets about their wedding day. Standing Room Only appreciate your wedding day is one of the most important days of your life. We have many years experience in ‘stand up’ style wedding catering. We take the time to discuss your wedding vision: casual or formal, intimate or large. We provide a boutique personalised catering service from planning to the end of your wedding day. Thoughtful advice when choosing options for your wedding menu. Hand prepared, fresh gourmet finger food that will leave you and your wedding guests delighted and satisfied. Wedding food specially designed to be easily eaten while mingling. Mobile catering service will come to your venue or home in Brisbane. View Menu OptionsWedding food that will come second only to ‘The Dress’ ! Call the Chef on [sro_clickable_mobile] to tailor your ideal wedding menu. Standing Room Only pride ourselves on wedding reception catering which is a little bit different. We’ve worked alongside some talented Brisbane companies to deliver unique wedding receptions and commitment ceremonies. Olive is a travelling vintage cafe and bar. 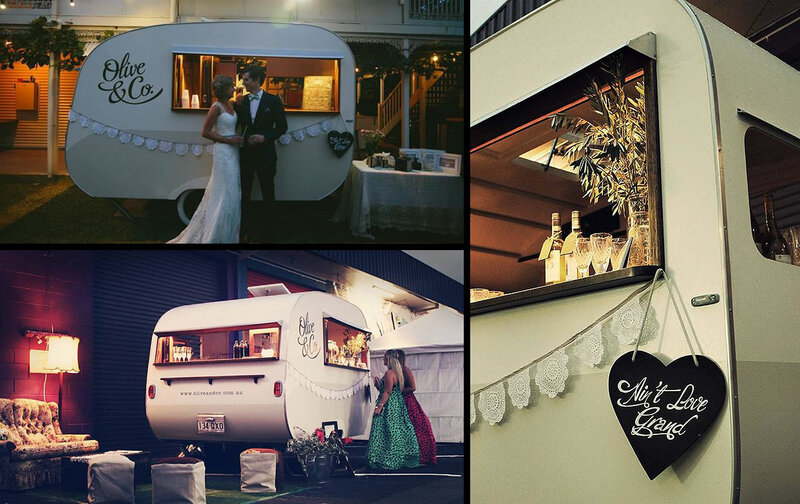 This newly hand-made, 1950’s inspired caravan will bring a touch of glam as well as drinks to your wedding. Get in touch with Olive & Co at www.oliveandco.com.au for more information. Vieille Branche is a creative space in an industrial backstreet warehouse at 10 Fox St, Albion, Brisbane. An ideal wedding and reception venue, particularly for stunning photography. Get in touch with Vieille Branch at http://vieillebranche.com.au.